This is an approximate preview. Your email might appear differently depending on the email client. The fiscal year for our association is winding down, and so is my term as PCAI president. I have thoroughly enjoyed serving that term, and look forward to continuing my service as past-president. Many thanks go out to my fellow inaugural board members Jan Salisbury, Nancy Buffington, Tom Hardison, Stacy Harshman, Ruth Romero, and Linda Secretan. You really made it easy for me to serve the association, and work through some tough things outside of the association. You all have my eternal gratitude. The past eighteen months have been absolutely amazing. Each of our members, whether they’ve been with us since 2011, or signed up recently, deserve kudos for taking action to raise the bar and visibility for the coaching profession in Idaho and beyond. We’ve had some great days, and our best days are ahead of us. I’m really looking forward to seeing how our new board members and committees take what has been done to date and move the association to new heights. And I have every confidence that Jan, as our new president, will provide excellent leadership, clearing the path for all of us to make a very real and lasting impact. Thanks again for all you do for and on behalf of those you serve. It’s an honor to be among you, and to have had the opportunity to serve as your PCAI president. Thank you for allowing me to lead the Professional Coaching Association of Idaho. I am excited to serve with our newly committed board. Our mission is to lead our association by sustaining growth and delivering exceptional value to our members and community. In 2011 we were a “start-up.” Dawn Monroe and I had an idea we believed was essential for the profession of coaching in Idaho. A small group of us traveled through the concept stage and have just reached validation with a functioning nonprofit board and a tripling of our membership. Our dedication to each other’s growth and to excellence in coaching has carried us far. We are now scaling our growth and establishing our future as an ICF Chapter! In 2017-18 we will continue to build our association. On May 31st the current and new board will meet for a mini-retreat dinner to share best practices and create a plan for the year.I see three primary directions: grow our membership, develop our coaching and business acumen and gain community visibility and trust. As has been true from the beginning, we will only reach our next destination if we do it together. Dig deep and ask what is your passion and how can you contribute? Inviting new members? Serving on a committee? Sharing your knowledge through a presentation? Leading an initiative? I promise there will be many opportunities. Join us. Together we will flourish. Let’s have another great year! Nancy Buffington, member of PCAI since 2012, is a public speaking coach. Her journey to coaching came, as it did for many of us, through teaching--most specifically when she worked with the Writing & Rhetoric department at Stanford, and had the opportunity to develop their Sophomore Presentation Skills curriculum. Nancy felt like this course helped people even more than the writing that she had done in the past. "Students came to the course with such fear and vulnerability. It was inspiring to watch them go from crying at the beginning of the semester to confidently standing in front of their class, answering questions." Around that time, Nancy started getting tired of doing the same old thing, so she was (again, as were many of us) forced to wrestle with the question: "what other skill do I have?" After talking with some of Stanford's tutors who were responsible for presenting to her students, Nancy realized that she could do this with adults. After a family move back to Boise (where she had grown up), Nancy worked for 2 years as an adjunct at BSU while getting her business up and running. She hadn't known anything about coaching or business, so "it took a while to figure all this out!" She found success from her first client, who stayed with her, on and off, for three years. Her introduction to PCAI came through Janice Lung, who she knew from social circles. 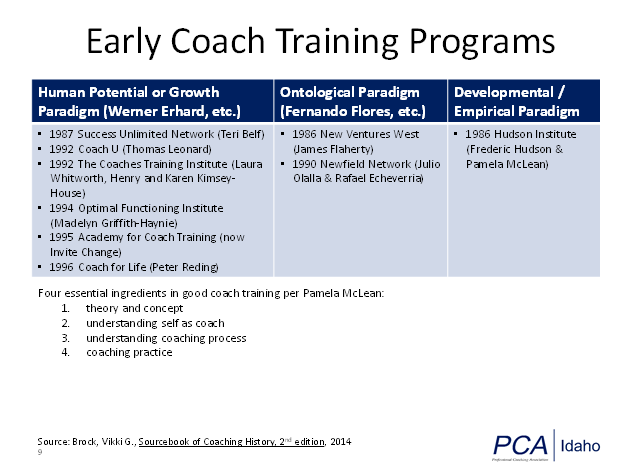 Nancy credits PCAI with teaching her about the coaching community, best practices, and ethics of the coaching professions, which she hadn't known about before and which are so helpful to us as coaches. The early group consisted of Idaho's most experienced coaches, who helped coach Nancy into solving the issues she was facing in her own young practice. "PCAI is a great way to network with other coaches, specialties, resource connections, etc. It helped make me more honest and accountable to myself as a coach." Now, 5 years later, we are glad to have Nancy's own experience contributing to PCAI's list of specialties. She is an invaluable member of our community. Say hello to her at our next meeting (at which she will be presenting)! 2. July and August: Summer hiatus--but your board will continue to meet to prepare for an exciting new fiscal year at PCAI! 3. September: Mark your calendar for 9/8, 11:30 AM--Watch for news of a meeting unlike any we've had, featuring one of our members in an important new role! To see the slides from Dave Covington's excellent May presentation, "Design Thinking for Coaching," please visit our resources page. There you will find links to download this and other useful documents shared by our members. For your convenience, past Newsletters can be found on the Newsletters page. Our social media pages are up and running, but a bit sleepy, so wake them up with your own questions, thoughts, and discussions! Use Facebook for general coaching conversation, LinkedIn for referrals and recommendations, and our Website for discussions that need to remain private! Greetings fellow coaches, and welcome to PCA Idaho’s first newsletter. This is the latest milestone in a list of many from the past year. We’ve come a long way baby! About a year ago a handful of us were developing the formal structure of our organization over dinner at a downtown Boise restaurant. This resulted in our first slate of officers (Jan Salisbury – VP, Nancy Buffington – Secretary, Tom Hardison – Treasurer, and yours truly as President). Immediately following that we identified our committee chairs (Stacy Harshman – Membership, Ruth Romero – Communications & Marketing, and Dawn Monroe – Programs). Dawn had an opportunity to relocate to Montana and closer to family, so Linda Secretan has capably assumed the Programs role. This became your organization’s board of directors, and we’ll serve in these roles until the end of May 2017. …accepted our first corporate member, Community Partnerships of Idaho Inc. The list above only covers the highlights. There are myriad other “behind the scenes” efforts and achievements undertaken by nearly every member, regardless of how long they have been associated with the organization. I’m very proud to be a part of this mission-focused, community-minded, and diverse group of coaching professionals. Our past is something to celebrate, and our future is bright. Thank you for your part in it! Dan Long has been a member of PCA Idaho for two years, having been introduced to the group by Ruth Romero, now our chair. His start in coaching came very naturally: "After running a successful company for 25 years, people start to seek you out," Dan says. Dan currently owns the Sandbox Group, where he has been helping other business owners succeed for 8 years. Sandbox Group works mainly with entrepreneurs, risk-takers, and other creative types. Dan has noticed that these sorts of people "try to be geniuses with a thousand helpers. We help them focus on one or two strengths, then hire the rest of it." The Sandbox Group is named after a number of analogies that Dan likes to use with his clients. "Learning to work well with others in the sandbox sent me to meet the President in the White House. You have to realize that some people are good at digging, some are good at building walls, and some are good at tunneling. They all have to work together to build something." You can see Dan at PCA Idaho's monthly meetings, or catch him on the news: KTVB 7's "It's your Business", Fox 12's "Business Solutions", and AM 670 KBOI's "A Closer Look at Business" all air weekly. Vistage helps business executives engage in peer mentorship. Come hear David Spann share Vistage's approach to leadership growth and development, and discover some tools to use in your own coaching practice. In lieu of our normal December meeting, we will be holding our annual Christmas party. We would love to see you there, so if you haven't joined yet, now is a great time to do so! We will ring in the new year with another unique view of coaching, presented from the perspective of one of our members. Coaching Resources from our Members (shared during the July meeting). We hope you find them useful! Our social media pages are up and running! Visit us on Facebook for general coaching conversation, LinkedIn for referrals and recommendations, and our Website for private discussions about your coaching practice!